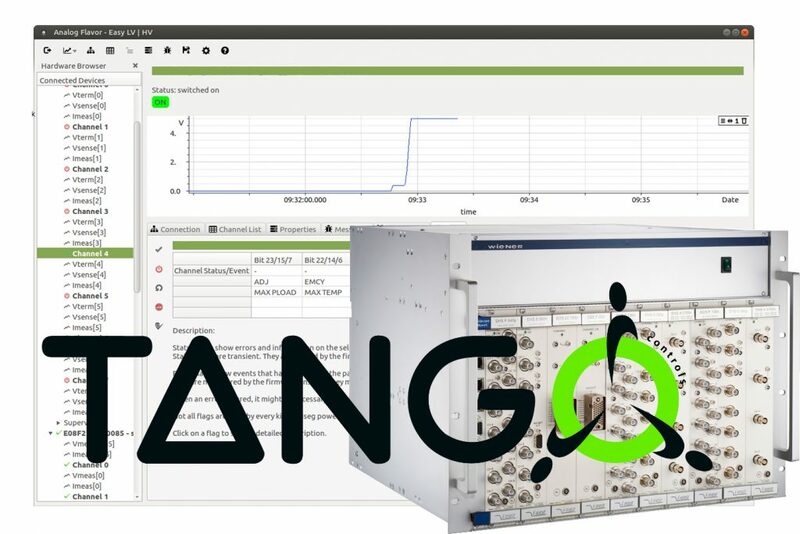 The TANGO control system is a open source control toolkit. It is used for controlling synchrotrons, lasers and physics experiments. It has been developed by a consortium of research institutes. We have developed 2 device servers to control MPOD crates with TANGO. We developed 2 device servers allowing to control MPOD crates with TANGO controls. The first device server “WienerMpodLvHvCtrl” establishes a network connection to an MPOD crate controller. It now translates TANGO commands to SNMP variables and back. The crate’s functionality are available as attributes. These attributes allow to switch the crate on and off and to control it’s state. The second device server “WienerMpodHvModule” connects to the first one and exposes the module and channel commands as attributes. “spectrum attributes” show the last measured voltages and currents. Therefore Jive can show the last measured values in a graph. Important: WienerMpodHvModule only supports iseg HV modules. The device server source code can be downloaded from GIT hub. The GIThub wiki shows some screenshots taken from Jive. The device server source code can also be found from the TANGO classes catalogue in the section “power supply”. Several clients can connect to an MPOD at the same time. Therefore we strongly suggest to familiarize with the MPOD by using our control software Easy LV|HV. This software also makes it easy to configure your MPOD crates with TANGO. If you prefer EPICS, this post might help you to set up your MPOD crate with EPICS. Contact Physical Instruments for hardware related questions and Analog Flavor for all questions concerning software.